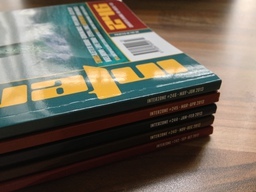 Back in October 2012 TTA Press reformatted both Interzone and its sister publication Black Static into a half-size, semi-hard backed shape. The size is similar to the US stalwards Analog and Asimov's, but the cover is harder and glossier and it has a flat spine. I really like the new look, and it's a bit of a shame I didn't complete at least a calendar year's worth of them. I will probably pick up the odd issue now and then, when a name I recognise catches my eye. Perhaps one day I'll have the time and inclination to read short fiction regularly again. I'd still wholeheartedly recommend it (and Black Static) if short fiction is your thing.